Pasties Go Posh at Picnic Cornwall! 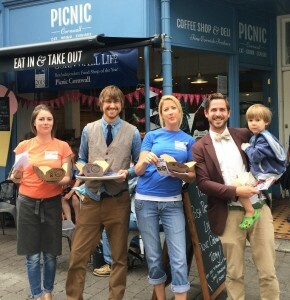 Chef and TV Personality James Strawbridge and his Posh Pasty Co popped up at Picnic Cornwall in Falmouth on Friday 15th August to celebrate the launch of Posh Pasties at the Coffee Shop and Deli and their ‘Pasties by Post’ service via the shop’s website. ‘Having James and team along to do sampling with customers brought a great buzz to Church Street’ says Emma Douglas, Owner at Picnic Cornwall ‘passers-by loved the pasties and it was great for people to ‘meet the makers’ and hear about recipes and provenance first-hand from James. The hand-crimped pasties, made to Strawbridge family recipes won in this year’s British Pie and Taste of the West Awards. Posh Pasty’s golden pastry is achieved using organic flour and Cornish butter and each pasty comes in its own recycled box with a pot of condiment specifically matched to enhance the pasty’s flavours. ‘We pride ourselves on delivering delicious flavours using quality Cornish ingredients’ says James ‘we are extremely proud that our pasties have already won awards and especially pleased to be working with Emma and her team at Picnic Cornwall giving people access to our pasties right in the heart of Falmouth and also nationwide through their popular website’. ‘Like Picnic Cornwall, sustainability is at the heart of our business with all of our suppliers as local as possible. We’re pleased to be part of Picnic Cornwall’s efforts to support the Cornwall Food and Drink Choose Cornish Campaign – helping locals and visitors to Falmouth Choose Cornish produce every day’. Posh Pasties are available to order online from picniccornwall.co.uk for delivery throughout mainland UK. To win 20 Posh Pasties by Post delivered to your door go to picniccornwall.co.uk and click Win Posh Pasties by the end of August.